Riptide GP emerged from the Tegra zone late in May, touting amazing graphics that the Android system is now capable of pulling off. However, is it all flash and no substance? 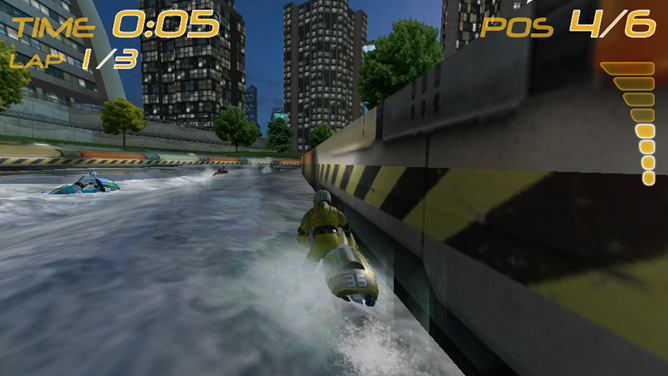 Riptide GP comes to us from Vector Unit, the developer of Hydro Thunder Hurricane for the Xbox Live Arcade. 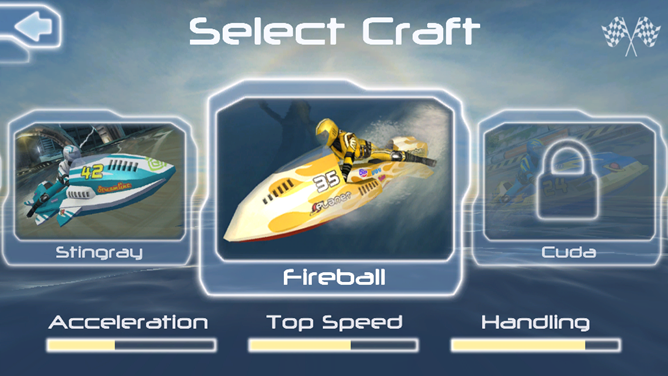 While that game features a number of souped-up racing boats with weapon attachments, Riptide GP returns to the water for a comparatively tuned-down affair. 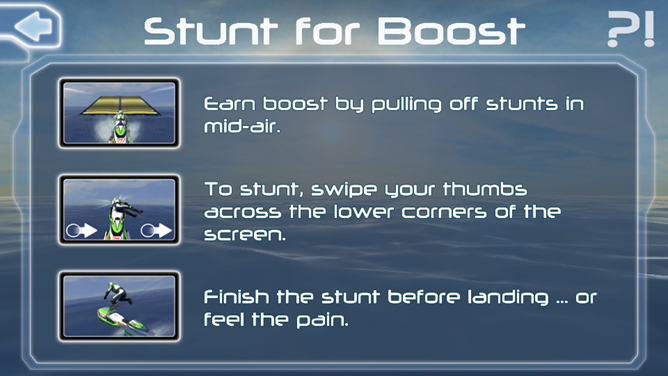 Instead of boats with Gatling cannons, you race jet skis against AI opponents; you can pull off tricks in order to fill a boost meter, which can then be used to further a lead or recover from a costly spill. 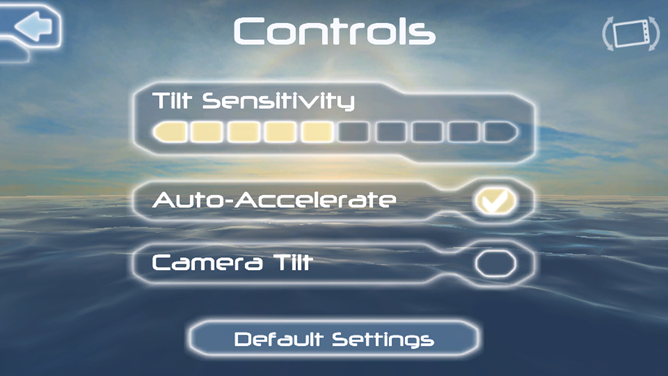 The game's controls rely on the touchscreen and tilt sensor, primarily. 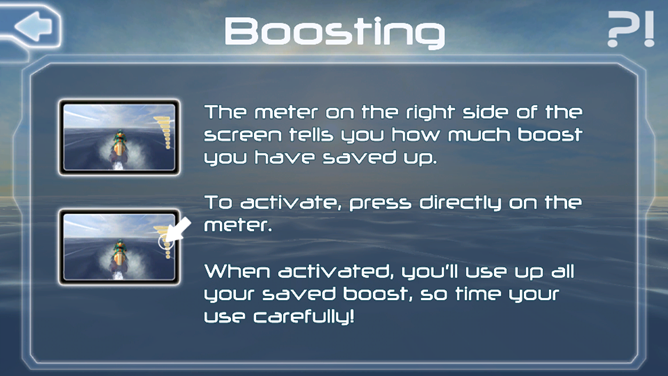 You turn your phone (a la racing games) to steer, while the game automatically accelerates you. Touching and holding the bottom-left corner of the screen activates the brake, while the bottom-right allows you to manually accelerate. Vector Unit chose not to give you any buttons to indicate these areas, but upon pressing you'll see a white outline around where you touched, indicating input. These controls were surprisingly good; I usually approach any game that requires touch/tilt controls for any amount of precision with skepticism. After a few races you'll learn the quirks of your chosen vehicle, and after awhile you'll find yourself going through a lap without bumping into anything: that should be an achievement in itself. However, until you've got them nailed down, you will be steering into walls. A lot. There's a bit of a learning curve in this game, as until you learn that you have to ease out of turns slowly, you'll curve too sharply. Tricks are performed by dragging two fingers in any number of directions. 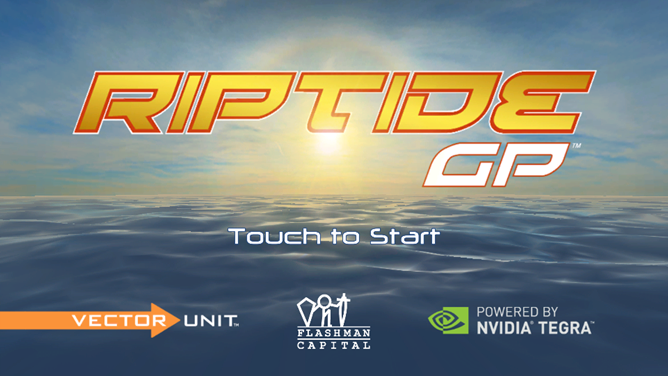 After horrible experiences with gesture recognition in other games, I'm pleased to say that tricks aren't a pain to pull off in Riptide. This earns it points from me. 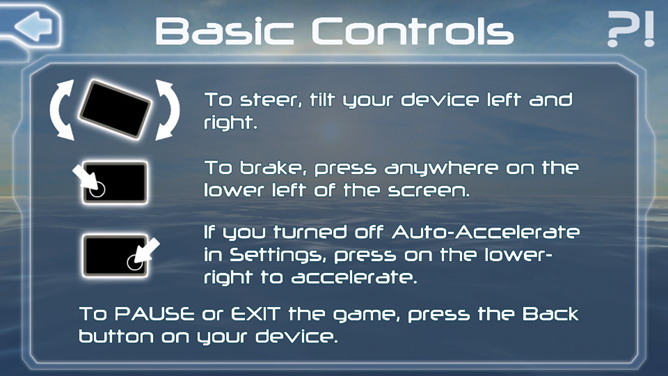 After nailing down the controls, you'll want to try out one of the game's main modes of play. 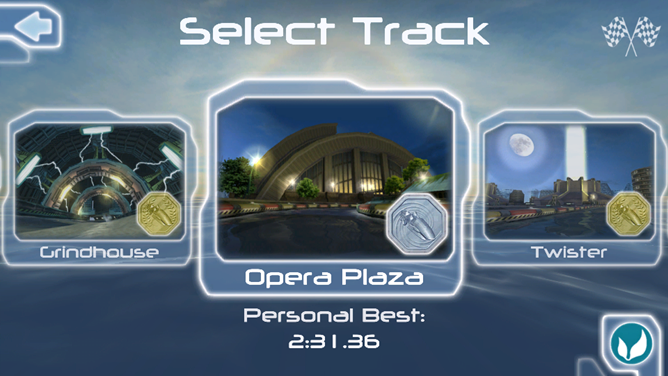 The standard time trial "Hot Lap" mode allows for single player racing, which I recommend for getting to know tracks. 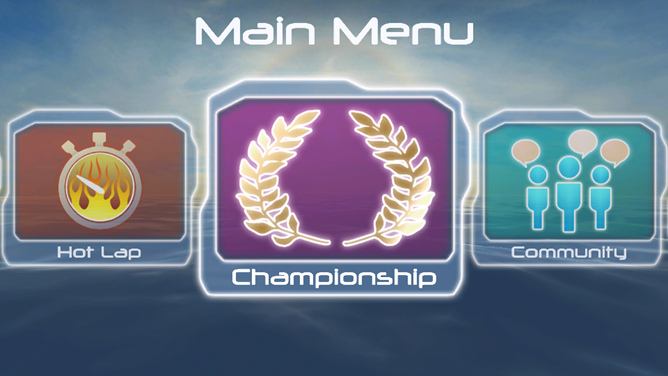 After that, there's a standard "Race" mode where you can earn medals for placing in the finish, and a "Championship" mode where your standings in a series of races affect your point totals. That way, you can lose a race and still "win" the championship series if you have enough points. 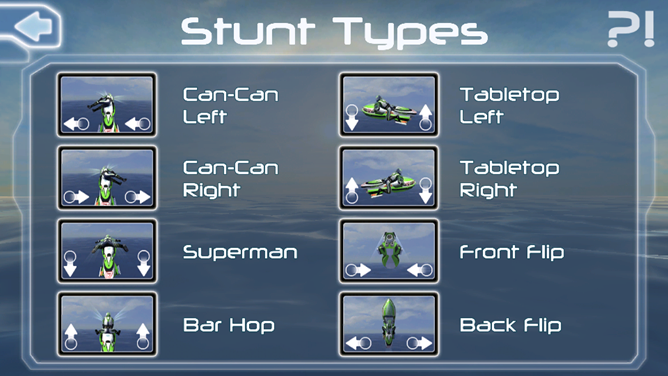 Each of these come in a different engine class, indicating difficulty. 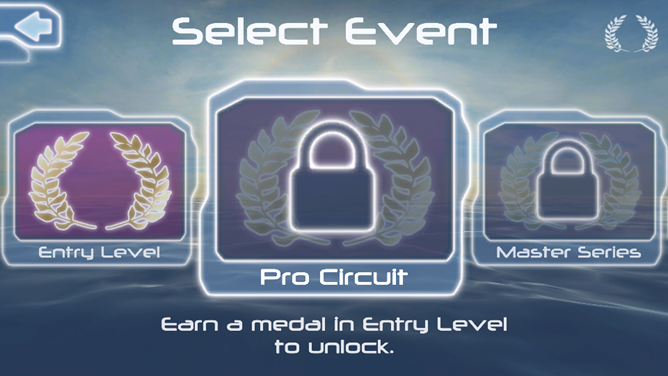 You're rewarded for completing different races and classes with new jet skis and tracks. 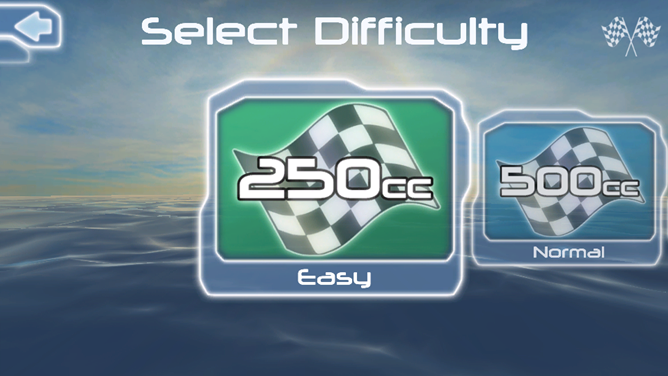 Each jet ski has different statistics to favour different racing styles: I, for instance, have always chosen the highest acceleration in any racing game I've played, solely due to Yoshi's dominance in Mario Kart for the SNES. 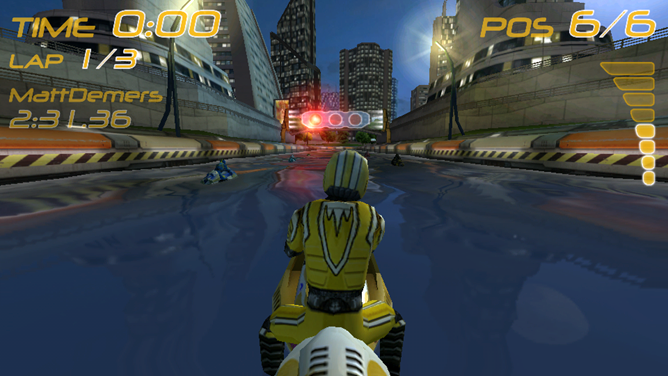 Riptide GP is optimized for Nvidia's Tegra 2 chip, which comes standard on a number of Android devices. It makes full use of the "HD" moniker, giving us vast cityscapes and some gorgeous water. When they said that this was console-quality, they really weren't kidding. I was worried that Riptide was going to be considered a bit of a tech demo for Tegra 2, and I've mostly (see below) had those feelings have been proven wrong. Obviously, it looks stunning for a mobile game, especially the way the water physics work. The waves' chop really affects how you need to go into turns, and it makes sure that each race isn't the same. You're even affected by the wake of your opponents, so driving too close to that idiot in front of you might waylay your plans for victory. However, even after all this praise, there are a couple of caveats: a majority of Android devices won't be able to play this game, nor will all people enjoy the use of tilt controls. Ultimately, there's too few tracks (six, and then their mirror versions) and jet skis (again, six) to justify a $6.99 asking price; I have a feeling the price was to set a precedent for HD games in the future. 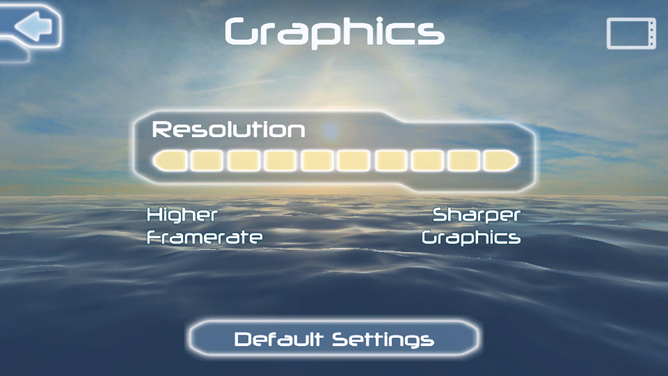 It takes some tweaking in options (turning off the camera tilt, auto acceleration, or the higher-quality graphics, for instance) to ease into the game, but until a player finds that perfect balance, they may be frustrated with the controls. However, once you find that sweet spot, the game becomes surprisingly functional for a game whose marketing has relied on its graphics. 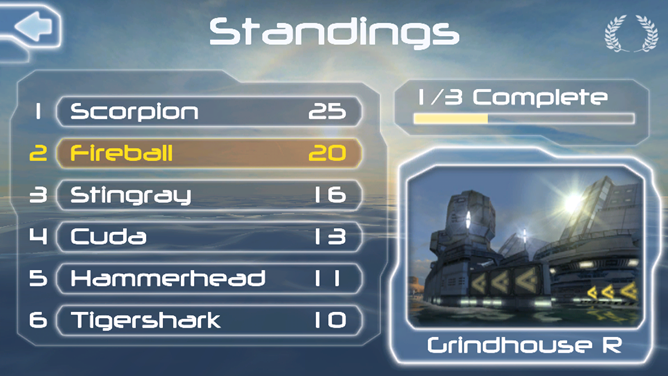 I can honestly say that I eventually had fun playing Riptide GP after I knocked the racing rust off. 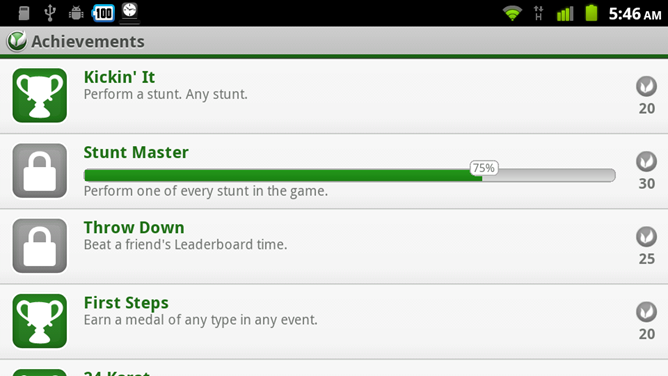 I definitely enjoy it more than the Asphalt series of games, or Need for Speed: Shift. 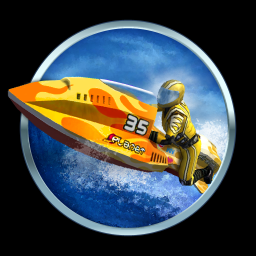 For those unwilling to take a chance with that $6.99 pricing, Vector Unit has provided a demo that features one jet ski and one track; this should be enough to get your feet wet in the game, no pun intended.